Cheesecake. I love cheesecake. It is truly one of those desserts that I simply cannot resist. I’m guessing it’s the combination of the crisp, slightly salty graham crust paired with the sweet creamy texture of the cream cheese filling. Regardless of the reason, cheesecake equals bliss in my book. Although we will pretty much nosh on any cheesecake that we come upon, we are extremely partial to the creamy and fluffy variety. You know, the kind that just sort of melts in your mouth and brings a big smile to your face. If you’re a fan of cheesecake, definitely keep reading because this is hands down the best cheesecake I have ever made. Period. My whole family loves cheesecake (except my dad), so when I decided to go home for a visit last Sunday, I decided to bring along a cheesecake. The question was, what kind of cheesecake? I pondered on this question for a couple of hours and finally decided to keep it simple. I had an ample supply of ripe, juicy blueberries and raspberries in the fridge, so I knew they would play a role, just not sure in what capacity. I ended up establishing my game plan at the last minute; lemon scented cheesecake with a glossy berry topping. Simple, delicious and perfect for summer. 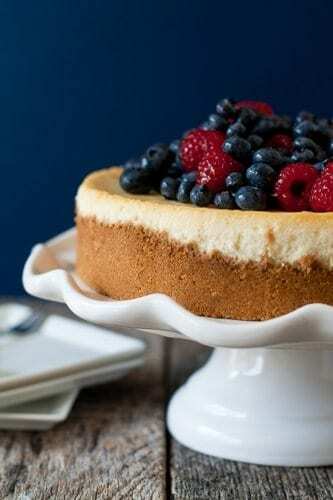 This cheesecake was a big hit; it was extremely creamy with a fresh, crisp flavor from the lemon zest and fresh berries. Brian ate himself sick after consuming two large pieces. My mom’s boyfriend, Johnny-O, loved this cake so much she caught him scarfing it from the storage container while standing over the kitchen sink and refused to give her a bite. Personally, I’m all for sharing and spreading the love EXCEPT when it comes to cheesecake, so I totally get the selfish mentality over this dessert! 1. Make sure you use a good quality springform pan. 2. Use a water bath! 3. Wrap the bottom half of the pan tightly in heavy duty foil before baking (this helps prevent the water from leaking into the pan). 4. If you are slightly OCD like me, place the foiled pan into an oven bag for extra security. 5. Allow the baked cheesecake to cool in the oven and then on the counter before placing in the refrigerator (directions will explain this). 6. Have a back-up plan if your cake cracks…fruit acts as an excellent crack concealor or you can just embrace the cracks! 1. Preheat oven to 350 degrees F. Tightly wrap a 9 inch springform pan in heavy duty foil. This step prevents leaks when using a water bath. I also take the extra step by placing the foil wrapped spring form pan inside an oven bag while baking. 2. Mix together the crust ingredients and press into the bottom of your pan and about 1 inch up the sides. Bake for 7 minutes and cool completely on a wire rack. 3. Begin to boil a large pot of water for the water bath. 4. In the bowl of your stand mixer fitted with your paddle attachment, combine the sugar and lemon zest and mix until the sugar is moistened and fragrant. Add in the cream cheese and cream together until smooth. Add eggs, one at a time, fully incorporating each before adding the next. Make sure to scrape down the bowl in between each egg. Add heavy cream and vanilla and mix until smooth. 5. Pour batter into prepared crust. Place pan into a larger pan and pour boiling water into the larger pan until halfway up the side of the cheesecake pan. 6. Bake 45 to 55 minutes, the edges will appear to be set, but the center will still have some jiggle to it. At this point, close the oven door, turn the heat off, and let rest in the cooling oven for one hour. After one hour has passed, carefully remove the cheesecake from the water bath and place on a cooling rack to cool completely. Once the cake is completely cooled, place it into the refrigerator for at least 5 hours. Top will fresh berries and serve. - For glossy berries, simply add 1 tablespoon of hot water to 1/4 cup apricot preserves. Blend until combined and thinned out. Place the berries in a bowl and gently brush and toss the berries with the apricot and water mixture. - If you are not a fan of lemon, simply omit the zest. Hi, I’ve been reading your blog for awhile now and I tried this awesome cheesecake recipe, it was amazing and so delicious, but I had a problem with the water from the water bath leaking through the pan, I double-wrapped the pan with foil but I couldn’t find big enough oven bags, how can I substitute the oven bag, since the foil isn’t enough? Can I try with puttin the pan in a silicone round cake pan instead of an oven bag or this will affect the baking and the baking time? I’ve never personally used this method so I cannot answer for sure. I don’t believe this would change temp or cooking time, though. I was wondering if you used the heavy duty extra wide tin foil? They have foil thats wide enough that it should cover the spring pan adequitly so that it should go up at least 4 inches up the side.of the pan. This should prevent any leaking. I just use normal kitchen tinfoil. This was amazing – it was the first time I had ever made a cheesecake – and I was nervous. 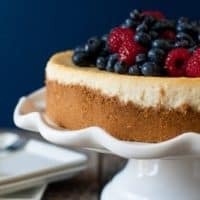 So, I researched zesting, why you give a cheesecake a bath, etc. After this, I made this recipe for my husband’s birthday because he loves cheesecake – this recipe ROCKS! I made it yesterday and there is only a quarter of it left today! It wasn’t difficult to make and it is sooo gooooood! This is definetely worth trying – thank you so much for an awesome recipe! It’s sooo appreciated!! What is it about dads and cheesecake? At least my kids’ dad likes cheesecake. I don’t think my mom ever gets to bake any. This is a perfect and easy recipe. Since I only had 2 packages of cream cheese I just couldn’t wait, so I cut the recipe in half and used 5 ramekins. I did add a couple of teaspoons of fresh lemon juice to the batter for a bit more zing. They turned out perfect, creamy and delicious. This recipe is being added to my cookbook so I will have it handy anytime I am craving a cheesecake. Thanks for sharing. That’s so great to hear! The extra lemon juice sounds like a great addition! Have a great day and thank you so much for following MBA! 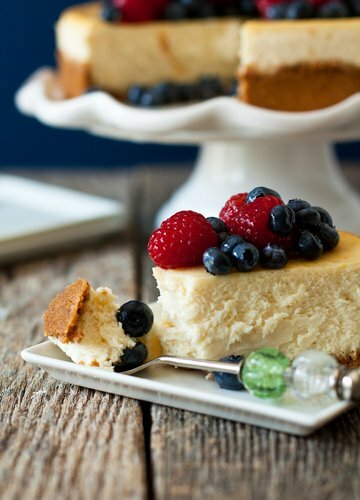 I have been making cheesecakes for years and this recipe is by far the best. Love the idea of turning oven off and leave in oven. I think this really help prevent cracking. Thanks, I will be looking for more. Thank you so much! I’m so happy that you enjoyed the recipe. Thank you for following MBA and have a great day! Ok ladies here is a guys perspective on cheesecake. Let the cheesecake bake for 1 hour 20 min.yes do leave in oven.don’t peek leave for 2-3 hours. Now here is the kicker.use vanilla wafers in stead of graham crackers. Then use 2 tbls flour.then a pint of heavy whipping creme.this is tried and true. Thanks for your recipe, it looks and smells great, went exactly by the recipe, I will keep you posted to let you know how it turns out. I hope you enjoyed the recipe as much as we did! We’d love to hear your thoughts. At what point do you loosen the sides of the springform pan? You can loosen the sides of the springform pan after cooling and before you refrigerate. I hope this helps. I’ve been looking for an awesome Lemon Cheesecake recipe and now I found one! I hope you have a chance to try it. Thanks for visiting! Love this recipe! My first time ever trying to make cheesecake was a success thanks to your recipe. My brother loved it so much he said it was as good as the cheesecake factory maybe better! Thank you so much for the praise, Talia! I’m so glad your brother liked it!